With the growing success of Kaiou I began to think of a way for people around the world to check to see if there were new versions without having to go and check a website to see. In 2002 I created a VB 6.0 version but it was never really made to the way I wanted it to be and since I no longer had 6.0 I couldn’t update it anymore. So, now, years later I’ve revisited the program and rewrote it from scratch in Visual C#.NET. This version is closer to how I imagined the program to work. 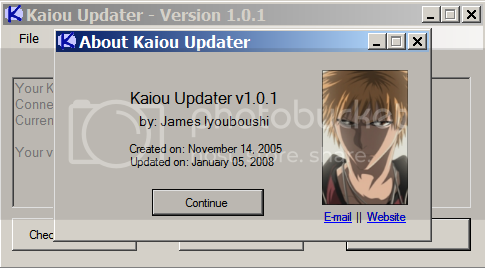 In 2005, I rewrote it from scratch in Visual C#.NET and thus Kaiou Updater Version 1.0.0 was born. 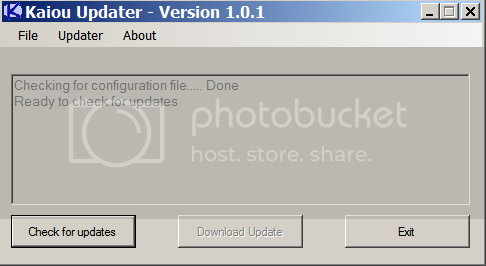 In January of 2008 I went back and updated it yet again bringing it to version 1.0.1. 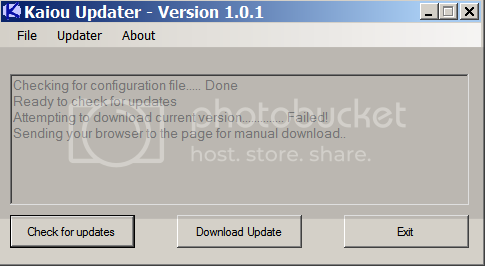 In December of 2011 I updated it to version 1.0.2 so that it, once again, works. This program reads your Kaiou “version.ver” file, and compares it to the one on the server. 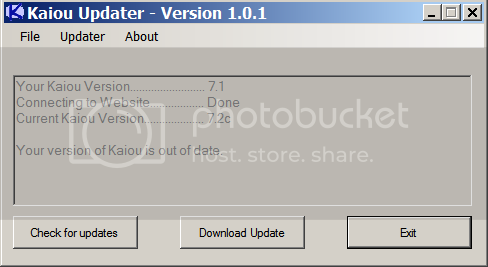 It will then tell you if there is a new version of Kaiou for download. Setup is simple. Just extract the exe file from the zip file into the folder of your choosing. I recommend the same folder as Kaiou, but it doesn’t have to be. Then run the exe. The first time you run the program a configuration file will be generated (which will contain a path to where the Kaiou Version File is located). From there all you have to do is click the “Check for Updates” button and you’ll be on your way. 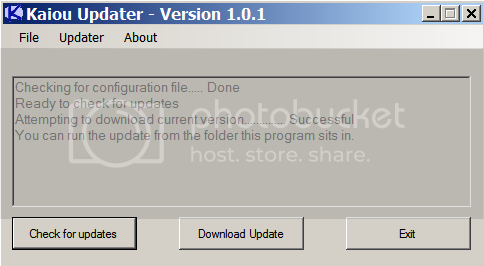 IMPORTANT NOTE – This program requires version 3 or greater of the .NET framework in order to run. IMPORTANT NOTE 2 – This program will only offer THE LATEST version of Kaiou. It is not smart enough to detect how many versions behind you are. Be forewarned that if you are not keeping your Kaiou up to date, it is best to visit the Forum and download ALL missing patches in order. Do not attempt to patch an older versions (more than one patch behind) with the most current patch. Note that some images may not fully represent the officially released version.